On Christmas Day, the Church traditionally celebrates three Masses. The first of these Masses takes place at midnight and is a celebration of the birth of Christ in time from the Virgin Mary in Bethlehem. The Gospel for this Mass is the birth of Jesus and the appearance of the angels to the shepherds. V. Why have the Gentiles raged, and the people devised vain things? Let the heavens rejoice and let the earth be glad before the face of the Lord, because He comes. Ant. In the splendor of the Saints, from the womb before the day-star, I have begotten Thee. On Monday evening, in the Ordinary Form of the Roman Liturgy, we celebrate the Vigil Mass of Christmas. On Monday, we celebrate the Vigil of Christmas in the Extraordinary Form of the Roman Liturgy. Traditionally, this was a day of penance and fasting in the Church and the vestments for this celebration are the purple of Advent and Lent. It is a 1st Class Vigil which means that if it occurs on Sunday, it overrides the Sunday liturgy in importance. On this day, more than any other day in the calendar, we are filled with a sense of anticipation - and the propers reflect this sense. Ant. Today you shall know that the Lord shall come and shall save us; and in the morning, you shall see His glory. V. The earth is the Lord’s and the fullness thereof: the world and all they that dwell therein. Ant. Lift up your portals, O ye princes; and be lifted up, O ye eternal portals, and the King of glory shall enter in. Ant. The glory of the Lord shall be revealed, and all flesh shall see the salvation of our God. 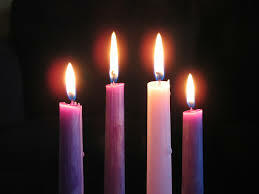 Next Sunday is the 4th Sunday of Advent - the last Sunday before Christmas. This Mass has a decidedly Marian character as we look forward to the birth of Christ later in the week. Next Sunday is the 4th and final Sunday of Advent. In this Mass, we meditate on our thirst for the coming of Christ: in the introit, we ask God to rain down upon us the Savior and the Gospel is a text on making straight the ways of the Lord. Then, as we move into offertory, the Mass takes on a decidedly Marian character as we turn our meditation explicitly to the Virgin Mother in whose womb is contained the Creator of the world and the Savior of the human race. Ant. Drop down, ye heavens, and let the clouds rain down the Just One; let the earth open and the Savior bud forth. V. The heavens declare the glory of God, and the firmament proclaims His handiwork. Ant. Hail, Mary, full of grace; the Lord is with thee. Blessed art thou amongst women, and blessed is the fruit of thy womb. Ant. Behold! A virgin shall conceive and bear a Son; and she shall call His name Emmanuel. This Sunday is the 3rd Sunday of Advent, traditionally known as Gaudete Sunday from the first word of its entrance antiphon. On this Sunday, we come to the surface for a breath as we near the end of our penitential season. This Sunday is also the hinge between the two halves of Advent: the first half primarily focusing on the 2nd coming of Christ and the second half primarily focusing on the coming of Christ at Christmas. This Sunday, we celebrate the 3rd Sunday of Advent which is frequently called Gaudete Sunday after the first word of the introit. This is one of only two days in the calendar where the celebrant is permitted to wear rose vestments. Rose is worn once during Advent and once during Lent to signify a brief respite from penance before plunging into the last weeks of the penitential season. Traditionally, this is a sign that our penance is almost over, but that it is also getting more intense. Therefore, the propers for this Mass emphasize joy and rest in Christ Who is to come. Ant. Rejoice in the Lord always; again I say, rejoice! Let your modesty be known to all men; for the Lord is at hand. Have no anxiety, but in everything let your petitions be made known to God by prayer. V. Thou hast blessed, O Lord, Thy land; Thou hast averted the captivity of Jacob. Ant. Thou hast blessed, O Lord, Thy land, and hast averted the captivity of Jacob. Thou hast forgiven the guilty of Thy people. Ant. Say: Ye frightened men, be strong and fear not; behold our God shall come and shall save us. Today is the 2nd Sunday of Advent. The focus of this Sunday is still the 2nd coming of Christ at the end of time, but now through the preaching of St. John the Baptist. Tomorrow is the 2nd Sunday of Advent. This is the first of two weeks where the Gospel centers on the action of St. John the Baptist who prepares the way for Christ. Ant. People of Sion, behold! The Lord shall come to save the nations, and the Lord shall make the glory of His voice to be heard in the joy of your hearts. V. Thou who rulest over Israel, hearken, O thou who guidest the flock of Joseph. Ant. O God, Thou shalt give us life, and Thy people shall rejoice in Thee. Show us, O Lord, Thy mercy, and grant us thy salvation. Ant. Jerusalem, arise and stand upon the heights, and see the joy which comes to thee from thy God. Tomorrow, we celebrate the feast of the Immaculate Conception - the day when we celebrate the unique gift of grace which God gave to Mary by which He preserved her from any stain of original sin from the very first moment of her conception.